The government of Ontario announced Thursday it will be providing $657 million over five years in new funding as a part of a green initiative to repair and retrofit social housing across the province, with the City of Toronto receiving more than half. "I'm very pleased to announce that our government is making a five-year investment into repairs and retrofits for social housing buildings across Ontario, totalling up to, contingent on carbon market proceeds, $657 million," Ontario Minister of Housing Peter Milczyn said in a news conference in Toronto, flanked by Mayor John Tory and MPP for Trinity-Spadina Han Dong. Milczyn said the investment is part of the government's Climate Action Plan to make social housing more energy efficient and sustainable. Initiatives under the Climate Action Plan are "supported by cap and trade proceeds," according to the government website. He said Toronto will receive up to $343 million over that five-year period, which includes the $43 million committed last year for 2016-2017. That means Toronto will receive about $300 million more over the next four years — with up to $120 million expected in 2017-2018, and up to $180 million between 2018 and 2021. "This is about helping to make social housing more sustainable in the long-term, and Toronto social housing residents — including those who live in Toronto community housing — will benefit through new energy-efficient heating, lighting retrofits, window placements, high efficiency and improved insulation," he said. Tory applauded the initiative as "good news for Toronto." 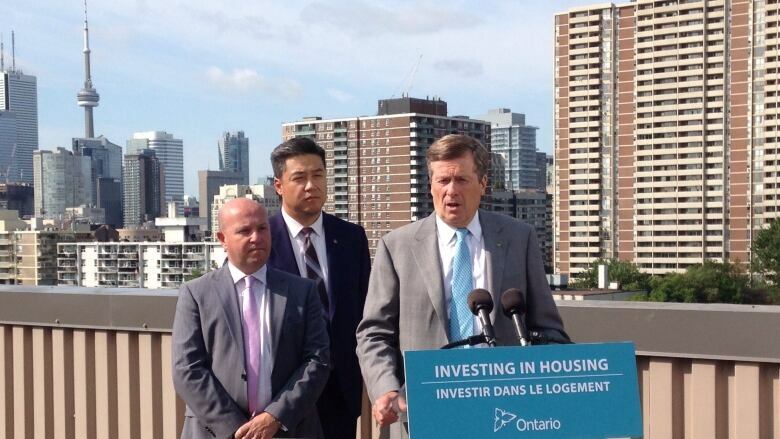 "This is money that the city did not have before to put towards housing, and specifically towards the repair and upgrading of Toronto community housing," Tory said at the news conference. "These new funds will help us to upgrade the living conditions, the comfort and well-being of the residents in social housing and will make a difference to some of our environmental objectives." Great things can happen when all levels of government work together &amp; I look forward to working with the Province to help build <a href="https://twitter.com/TOHousing">@TOHousing</a>. In a statement, Toronto Coun. Ana Bailão said the funding is "an important step forward." "This is an important time for all three orders of government to work together to ensure that every Torontonian has a decent, clean, safe and affordable place to live," she said. The Climate Action Pan is part of the province's strategy to reduce greenhouse gas pollution by 80 per cent by 2050, while also investing in programs that support a greener economy. According to the city, Toronto has 93,404 units of social housing under administration by the city's Social Housing Unit as of April 2015. Todays announcement by Minister <a href="https://twitter.com/PeterMilczyn">@PeterMilczyn</a> provides a new foundation for the working relationship on housing between the City &amp; Province.